Surprisingly, researchers used ascorbic acid (better known as vitamin C), to control the depositing of gold particles on nanorods. The interaction between gold nanorods and photons makes them extremely useful in biomedical applications, from imaging technologies to cancer treatment. 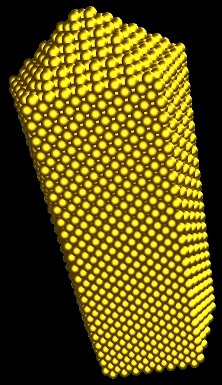 The study started with an existing technique in which gold nanorods are formed by mixing two chemical solutions together. The old method only converted 30 percent of the gold into nanorods, with the rest remaining dissolved in solution. To form the remaining 70 per cent of the gold solution into nanorods, researchers added a continuous stream of Vitamin C, while constantly stirring the mixture. The solution was stabilised with cetyltrimethylammonium bromide, a common ingredient in hair conditioner. It turns out the ascorbic acid pulls the gold out of the solution and deposits it on the existing nanorods. Even more excitingly, they found the slower they added the ascorbic acid, the stubbier the nanorods became. This is important because the optical properties of gold nanorods depend on their “aspect ratio” – their relative height and width. For example, long, thin gold nanorods absorb light at wavelengths greater than 800 nanometres (near the infrared spectrum), while shorter, wider gold nanorods absorb light at wavelengths below 700 nanometres (red or dark red). Recent biomedical applications for gold nanorods include sensors which can read and detect tiny sequences within samples of DNA, which can help diagnosing patients, solving crimes, and identifying the origins of biological contaminants, such as a pathogen in a water supply. “This technique should facilitate the economical manufacture of large volumes of gold nanorods,” says Dr. Joseph Tracy, an associate professor of materials science and engineering at North Carolina State University and senior author of the paper published in the journal Chemistry of Materials. “That should be good news for both the science community and the biomedical research and development community,” he said.